The new architecture, depicted in the picture below can exceed a 40 percent conversion efficiency, and even when irradiated from the side it generates solar conversion efficiencies that rival, and may eventually surpass, even the most ultra-efficient photovolataics. 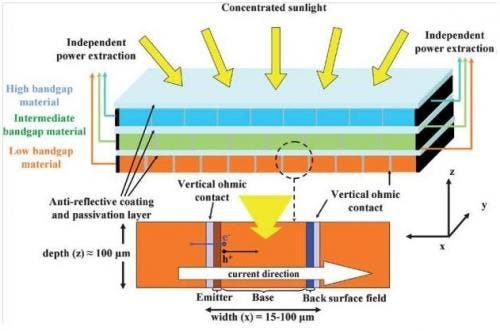 The new cell was developed by researchers working on the David Ben-Gurion National Solar Research Center, and they can reach and even surpass the already traditional landmark: 40 percent conversion efficiency with intensities equal to 10,000 suns. “Typically a concentrator solar cell comprises interdependent stacked materials connected in series, with significant associated fabrication difficulties and efficiency limitations,” explains Prof. Jeffrey Gordon, a member of the Department of Solar Energy and Environmental Physics at BGU’s Jacob Blaustein Institutes for Desert Research. “Our new designs for concentrator photovoltaic cells comprise multiple tiers of semiconductor materials that are totally independent, and overcome numerous challenges in compiling the elements of even the most efficient solar cells,” he says. But perhaps the most important thing in this new design is that they managed to put to use materials which had previously been deemed unsuitable for the task, such as silicone. Tailoring the cells to edge (side) illumination reduces the cell internal resistance to negligible levels.